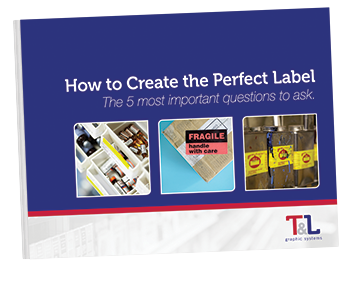 Whether your label needs are simple or complex, T&L will help find the best custom commercial label solutions that meet your needs. Our state-of-the-art equipment, combined with our full-service in-house art department and plate-making allows us to craft precise, unique printed prime labels for any commercial or industrial application. If you need custom commercial labels, we can make it! If you would like us to use your exact artwork, please check out our Artwork Guidelines. Contact us with your questions and thoughts. What Do You Need and Want From Your Label? From 1 color up to 8 line colors, or 4-color process printing, allow for bold and vibrant hues of nearly any shade imaginable. Our Domino High Speed variable imaging system provides lasting, durable black imprint for all types of labels. Long-run or short-run print job capacity for any-sized label imprint job. Create your own artwork or let our in-house art department design your labels, logo and/or private branding. Our custom die cut designs look great on the shelf next to any competitor. Plus we’re experienced in ensuring your label clearly informs the consumer of the product contents, as well as ensuring your product fulfills all label requirements. We offer high-speed variable imaging for label jobs of any size. Long-run or short-run, we have the technology and expertise to create consecutive or random numerical labels for commercial and industrial products, assets and equipment. Create randomized barcode labels or sequential serial number labels to complete your product packaging or shipping labels with ease. Ask us about industry-leading, high-speed, long-run variable imaging technology. T&L prints high quality labels of nearly any size and shape. From precision medical labeling to large drum labels, we have the know-how and the capacity for both short-run and long-run label jobs of all sizes. We print labels up to 16” wide and provide custom shaped blank labels up to 20” wide. Need a custom label shape? Our custom plate making and custom die cutting allow for any shape and size required to create your perfect customized commercial label. 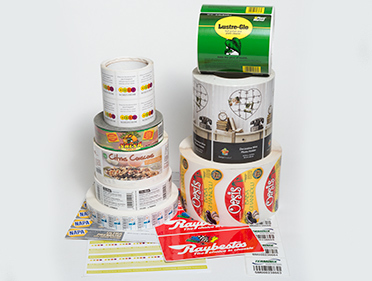 We carry over 200 different label materials, but don’t let that limit your label project! We print on a wide variety of materials, including paper, film, vinyl, plastics, fabrics, and so much more. Need something special? Just ask. We’ll find your perfect label material and craft a completely unique look and feel to your label. Specific use requirements like weather or chemical protection? We’ve got your labels covered. Try new linerless labels. These labels print directly onto the back of an adhesive surface, so application is as easy as peeling a roll of tape. Don’t worry about the fuss of backing or the cleanup involved when attaching bulk labels. We can print all the information you need on a linerless label and speed up your label application process. 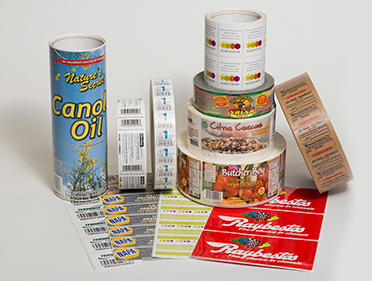 We offer numerous specialty label adhesives to suit your label application needs. Just let us know your label needs and we’ll find a material + adhesive combination to suit your application and the surface to which you’ll be adhering the label. We work to find a custom label adhesive solution that works best for you. How do you want your labels? We offer rolls, sheets, and fanfolded labels. Rolls – Your labels, neatly rolled onto a core. We offer multiple core sizes and you can even specify the number of labels per roll. Sheets – Sheet labels are quick and easy to use with a professional look and design, plus we maximize the number of labels per sheet so you get the most for your money. 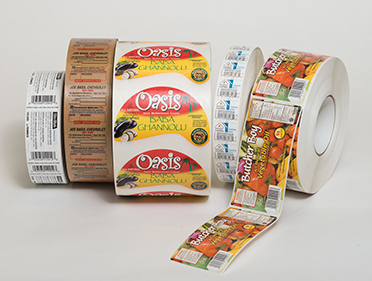 We offer crack-and-peel style designs and piggyback labels, designed with layers for use as built-in return labels or simply to share additional information. We also offer back printed labels, if you’re looking to include application instructions or additional product or label use information right on the backer sheets of your labels.